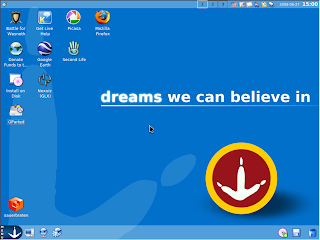 Sabayon Linux 3.5 was launched, as announced by Fabio Erculani on the official forums. The popular distro is available for x86 and x86_64 architectures, featuring the Linux kernel 2.6.25.9 with extended wireless, laptop and filesystem (including unionfs, aufs, squashfs, ext4 and NTFS-3g) support. Sabayon 3.5 was codenamed "Ibex Poacher", for certain a pun on Canonical's future release, Intrepid Ibex. The "Ibex Poacher" boasts a faster boot time that will take something around 30 seconds, depending on your computer and an easy to setup 3D desktop with out of the box hardware detection. The default desktop environment set is made up of KDE 3.5.9 (and KDE 4.0.5 available as a separate download), GNOME 2.22.2, Xfce 4.4.2 and Fluxbox 1.0. Moving on to office applications, we get OpenOffice 2.4, the free and open source office suite. For web browsing and filesharing, there's Firefox 3.0 and aMule 2.2.0 respectively. Flash 9 and Java 1.6 will make your web browsing experience a better one, as they come by default with Sabayon and you won't go through any more installation processes. You get a lot of popular games, including Sauerbraten, Nexuiz, Quake 4, Warsow, Savage and Wesnoth, backed up by the AMD/ATI Catalyst 8.6 and NVIDIA 173.14.05, 96.43.05 and 71.86.04 drivers with X.org 1.4.2, that can configure automatically input devices with the help of HAL. Wine 1.1.0 will help you run Windows applications on Sabayon, and VirtualBox 1.5 will allow you to test different operating systems on a virtualized platform. The package installation is made easy by Entropy 0.15.23.7, Sabayon's fast and user-oriented package manager. Probably one of its most important features is the fact that it is compatible with Portage, Gentoo's package manager. Download Sabayon Linux 3.5 right now from Softpedia.